THE NIGHT OF OUR LIFE (Checked Label). “She reached out an empty hand and I understand/ I gave her all I had and then a note/ there was a smile on her face when I said ‘honey, it's Jesus money'/ I said ‘what's your name,' she said Leanna/ used to sing on Sunset Boulevard/ big dreams in California slipped away before the curtain call/ a picture from her pocket showed her name up there in lights/ I heard God in her voice when she sang for me that night.” - Jesus Money - David Baird-Kenny Royster. 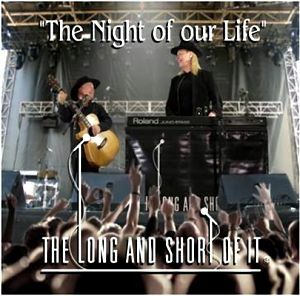 It's no surprise that indie Melbourne bayside duo the Long & Short Of It write videogenic songs that propelled their six albums onto radio, TV, awards and sales charts. Yarraville singer-songwriter David Baird and Williamstown lawyer Patsy Toop have developed their visual and literary talents into a prominent prototype for peers. Not only do they write, perform and record in an international sphere they translate their environs into credible creations. So it's no surprise when they recorded with co-writer and Emmy award winning producer Kenny Royster at his Direct Image studio in Nashville they found a song source in a nearby Music City alley. There, among the discarded clothes, luggage and rubbish, they noticed a homeless woman singing for her supper. She soon became the inspiration of their song Jesus Money - one of the highlights of this disc. We have set up the scene in the lyrics above but I won't spoil the amazing grace punch-line. That's captured graphically in the duo's video with Ruth Rogers-Wright playing the lead role of the rags to riches singer and Morgan Cockerell cast as the music producer. “If I could put a saddle on that Roo it would be one hell of a ride/ impossible to hang on, I would be crazy to even try/ kind of like trying not to drink at the pub known as Uncles .” - Kangaroo Rodeo - David Baird-Kenny Royster. 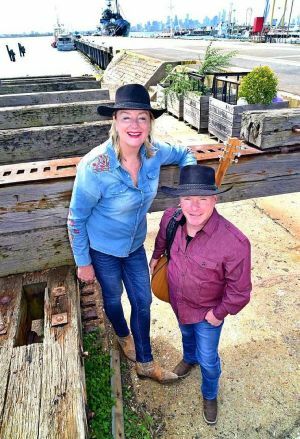 The classically trained duo, who met six years ago at a bayside charity concert, kicks off its album with a vastly different theme on the whimsical Kangaroo Rodeo. Baird illustrates a drinking metaphor - about the tough task of staying on the wagon - with the 8 second rodeo terminology. 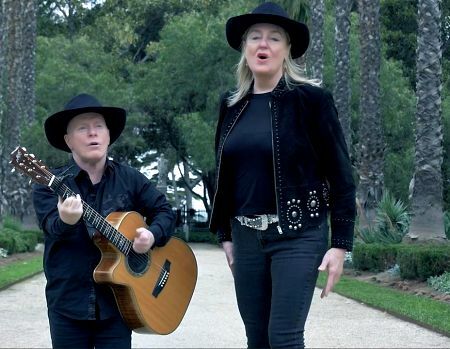 The song's appeal is magnified by a humorous video shot at the famed Walkabout Hotel in McKinlay , Queensland . Yes, the pub in the remote north west of the state that was used in Paul Hogan's Crocodile Dundee movie. It was originally known as the Federal Hotel and was built in 1900 and was licensed in 1901. McKinlay, population 417, is on the Landsborough Highway and 1,595 kilometres north-west of Brisbane and 228 kilometres south east of Mount Isa. It would appear from the video that a soaked slab of the local drinkers had cameos in the video. But they were upstaged by Baird who was unceremoniously dumped while riding a replica Roo out front of the pub. His pianist partner Patsy, mother of four, provides vocals but doesn't seem to have had to search her briefs for personal injury damages from her former profession. The duo dig deep into their daily musical menu to sing of their elation at being able to follow their dreams all over the world in the joyous title track. No complaints about the travel travails of peers whose journey is more a trial than committal to do the hard yards to success. “I think you were born under a rambling star/ you left an ocean of tears from all those broken hearts/ your dark eyes of mystery are still shining in my dreams/ just a wisp of what we were is out there calling for me.” - Gypsy Whitemoon - David Baird-Patsy Toop-Kenny Royster. Gypsy Whitemoon shares an evocative poignancy with Jesus Money despite a vastly different theme. “The song is based upon friends who we would characterise affectionately as Gypsies,” the duo revealed. They recruited actors Maddie Vulic to play Gypsy Whitemoon and Todd Allison Fehres as her lover. The song is loosely set on the Sunshine Coast but filmed at their favorite Williamstown Botanical Gardens , Warburton and Sherbrooke Forest near the Puffing Billy . Don't get the impression the duo have a staple diet of reflective narratives. Kiss Me Better enables singer Patsy to name check local ice creams - yes, Rocky Roads, Chocolate Chips, Oreos, berries, strawberries, peppermint creams, waffle cones and other delicacies - in her kissing love metaphors. Punny Don't Bait My Hook echoes fishing fantasies, replete with reef, boats, reels, rods, lines, tugs and pleas to the object of a love pursuit not to be one that got away. The duo also ignite their positive paean Just Give It All You Got by name checking historical figures who dared to dream. Yes, Albert Einstein, Walt Disney, Tommy Edison, two Ohio airmen brothers, spacemen Neil Armstrong and Buzz Aldrin and other pioneers from different fields of endeavour. Foolin' Around warns of modern technology being a cosmic camera to trap cheaters in a slightly different setting to Brad Paisley's selfie web of deceit on his 11 th album Love And War . They also explore the perils of hereditary hedonism in the rollicking One Of The Boys - yes, history repeats with a vengeance in the sting in the tail of this tale. But it's a dose of wry wisdom and chivalry that fuels the self-explanatory Old School . That segues into the pathos primed finale When I'm Gone where the legacy is a memorable song. The Night Of Our Life is a salient sequel to fifth album You Made Me Stronger in 2014. It also prompted filming in a picturesque seaside locale in the video for Two Thousand Years From Now . That disc also included Fifty Bucks And A Case Of Beer , accompanied by a live video, Latter Day Cowboy and Carry Me . The duo's success enabled Patsy and Dave to develop a Yarraville studio to provide a performance space for independent musicians and support of local venues.